For most teenage boys, it’s simple math. One long week of studies plus one warm late Friday afternoon equals time to hang out with friends and unwind. But on a recent spring day, that equation works out differently for Cameron Miller. It’s time for him to get down to some serious work at the Kansas City Ballet’s Todd Bolender Center for Dance & Creativity near Union Station. Scattered around a studio, nine dancers move in unison with arms rounded, chins tilted and backs straight, following the precise, rapid instructions of their instructor. Teacher Sean Duus weaves around the dancers, inspecting form and offering gentle suggestions. “Fondu front, fondu front, one to the side,” Duus says, pausing occasionally to demonstrate. “Now what would happen if I were to pick you up by the arms right now?” he says, stopping in front of one petite dancer. “That’s right, it wouldn’t be good,” he says, then glances across the room. “Cameron, after class, I want you to pick up every girl in this room.” Laughter fills the space, and the only other male dancer in the room, 15-year-old Cameron, grins and nods. This upper-level dance class at the Bolender Center holds a unique group of teenagers. Over the years, they’ve persevered and progressed through Levels 1 through 5. The kids who make it to Levels 6 and 7 at the dance school face an often grueling schedule of ballet, modern, jazz and other dance classes. Cameron, like many others in this elite group, plans to make dance his life’s work. Spend an afternoon with him and you’ll soon learn that he has earned the admiration of his fellow dancers and his teachers. 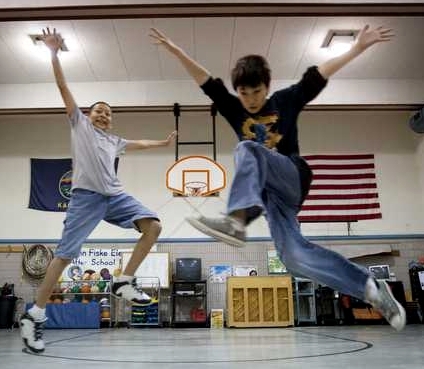 Instructors at the Kansas City Ballet School say that while dance is growing in popularity among boys, dance schools across the nation still draw relatively few young men. Cameron is one of 17 boys taking classes at the ballet school, which has more than 470 girls. Across town, at the Friends of Alvin Ailey studio space in the 18th and Vine Historic Jazz District, several young men are working to provide that competition down the road. Fifteen-year-old Deon Thomas-Scott has dabbled in dance since he was 9 and now spends several hours a day practicing. Deon, who attends Paseo Academy of Fine and Performing Arts, says his school’s culture encourages a respect for dancers. Watch Duus teach another group of kids on a Monday morning at the Bolender Center, and you’ll see one indication that in the future, more male dancers will progress to the upper levels. This is a “bonus” class just for boys that Duus started for the youngest male dancers at the school, a bit of encouragement to keep the boys interested in the art form. Griffin is big for his age, Barnes says, pointing to one of the tallest of the half dozen boys in the room. Dance, Barnes says, teaches his son coordination, and it gives the boy an outlet for his considerable energy. Ask them what goes into fueling that block of muscle, and mother and son laugh again. “I kept track one day, and I figure I take in at least 4,000 calories a day,” Cameron says. Fitting in the time to consume the energy is sometimes a challenge. On top of keeping up with his academic courses, Cameron puts between 30 and 35 hours a week into dancing. Duus has mastered the art of subtlety when working with kids. “If I teach the ROAD [Reach Out and Dance ] kids a ballet step, I’ll just slip it in there,” says Duus, who was a principal dancer in the Kansas City Ballet from 1986 to 2001. “I’ll have them sprint, then jump, then I’ll throw in a ballet step and they don’t even realize I did it. And once in a while, Duus says, a kid like Cameron will come around. “He’s focused, he’s limber, he’s hard-working and he has a great passion for dance,” Duus says. Cameron is rehearsing for a coming performance by the Kansas City Youth Ballet, the performing arm of the school. 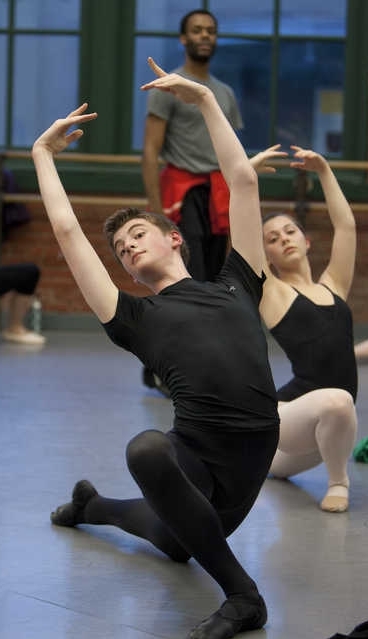 Students in the upper-level classes have the option of auditioning for the Youth Ballet, which gives aspiring dancers a chance to take the stage. Cameron’s mom glances into the studio, where he is showing his power and skill with gravity-defying jumps. “It’s a good thing he gets along so well with the other dancers,” Miller says, “because when he’s not focused on academics, he’s at the Bolender Center. There are days I look at him on the drive home and he just looks spent, like all the energy is drained out of him.” But he’ll greet the next day with the grace of the finest of dancers, she says. Miller has a simple message for other parents of boys interested in dance. “Listen to your child,” she says, adding that she thinks it unlikely that Cameron’s father would be encouraging his son to dance.